Carphalea kirondron, a flaming red beauty! Gorgeous flaming-red flowers that are very long lasting and definitely an attention-grabber! The first group of buds that were on this plant purchased in late June are still as fresh as ever, going into the 4th month now! How lovely and it has added two more striking red bunches. We are impressed since it’s planted in a pot and looking forward to enjoy them all year round! 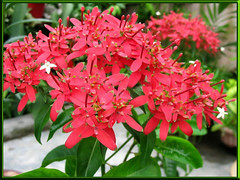 Plant type: Indoor ornamental shrub of medium height (1.5 – 3 meters), originated from Madagascar. Mainly, a tropical bush! Propagation: From seeds or stem cuttings. It may be difficult to propagate from seed germination, but not the latter method. Just cut 2 or more (to counteract failure) 5-6 inches length of stem cuttings (preferably when you need to deadhead and can spare a stem), trim of its leaves leaving a couple of them, then push into garden potting mix about an inch and a half deep, locate in shaded area and with regular watering, voila…you’ll definitely succeed with at least one, two or probably all from the many cuttings planted! Features: A medium height tropical shrub of up 3 m (or more if allowed to grow without restraint), that is gaining popularity in the tropics! It is a very showy evergreen bush with lanceolate to ovate-lanceolate rich-green leaves that are mostly opposite with 2cm long petioles. Covering the bush are large bunches (10-20cm across) of strikingly bright red calyx lobes. These calyxes are enlarged and unequal (1 is more enlarged than the others) and amongst them many tiny 4-petaled white flowers appear on filament-like reddish corolla tubes (1.5-2.5 cm long). The species is heterodistylous in long-styled and short-styled forms. Anyway, this whole plant is characterized by the presence of those remarkable red colored calyces, and the white flowers are actually insignificantly seen from afar! Usage: Being non-stop bloomers, it’ll be most suitable as a centerpiece in the patio, courtyard or garden. Whether as a potted plant or in ground, it’ll present a glorious sight at parks and entrances to shopping malls and hotels, provided it’s placed at sunlit areas! 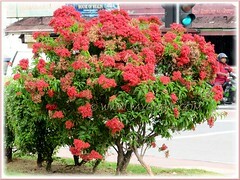 I have even seen these ornamental shrubs with their gorgeous bright red calyxes being mass-planted along highways, roadsides and road dividers. 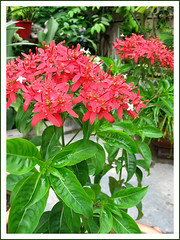 Go for this plant if you love brilliant red colors and want to attract butterflies to your garden! 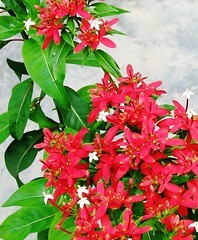 A wonderful plant that flowers all year round in the tropics. 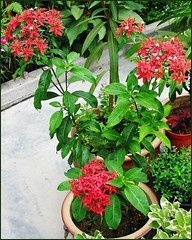 Care: This is another of those fuss-free plants that are easily maintained. Just the normal regular watering and fertilizing! 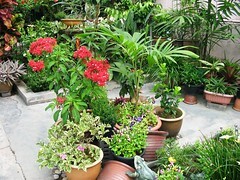 However, pruning is necessary to promote bushiness and more blooms. Also, deadheading is advisable to remove the unattractive sight of withered calyxes, though this task is infrequent as the blooms remain beautiful for months! Watch out for white flies that are very attracted to it! Aaargh…they’re nasty and can destroy the whole plant if you drop your guard! Other link: Check this site for more plant images and info. Our first Flaming Beauty plant had to be destroyed due to severe white flies infestation around April, 2007. However, I’ve managed to propagate a new plant from stem cutting before its demise and this is it, 6-7 months later. 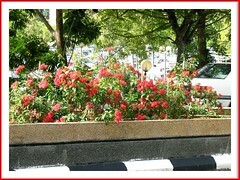 We chanced upon this gorgeous bush with glorious bunches of flowers, outnumbering the leaves, at a street junction in Penang during our short vacation there mid last year. Firecracker Flower (Crossandra infundibuliformis) exuding sunshine and warmth!